Microsoft is sticking a toe into the world of hardware with the announcement of Surface - it's own tablet that will run on the new Windows 8 operating system. Company executives showed off two Windows tablets and accessories Monday that Microsoft hopes will put it in the conversation with Apple's iPad and Samsung's Galaxy tablets. There is a scene in the 1999 TV movie "The Pirates of Silicon Valley" where young Bill Gates is meeting in the 1970s with top executives of IBM, trying to sell them DOS. Gates explains that he will only sell the license to use it, that his company, Microsoft, will retain all rights. After thinking a few seconds the IBM exec agrees, adding "everyone knows that the real money is in hardware." It's supposed to be a joke, since Microsoft went on to build a business empire built on software while hardware makers came and went. 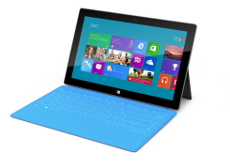 Company unveils 'Surface' running Windows 8 but doesn't announce a release date.